This is the second post of the food I made when my brother and his wife visited. We were not well so went with easy dishes. Although easy on my Louisiana Grills Pellet Smoker, a Prime Rib is always classy. I started by giving the roast a rub down with Louisiana Grills Mesquite Rub and Grill Seasonings. Normally I would use a mixture of onion powder, garlic powder, salt and pepper but I wasn’t feeling well and was being lazy. Then I cut the vegetables in large chunks and put them in a roasting pan. I put a rack over the roasting pan and put the roast on it. Then I put it all in the pellet smoker preheated to 350 F. Of course, you could put it in a 350 F oven but you won’t get that nice touch of smoke. I let it cook for an hour and then I added 375 ml (1 1/2 cups) of beef stock to the roasting pan. I continued smoking to an internal temperature of 140 F which is about medium. That took 2 hours. Now, here there was some contentions. My brother and I like our beef rarer. Our wives like them more well done. A wives vote counts for more than a husbands so rare was out of the question. 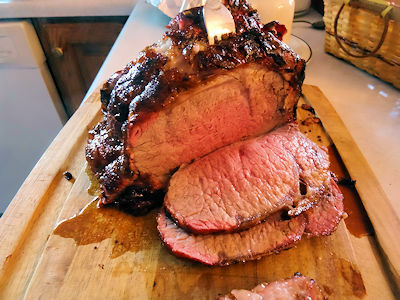 If you want a rare roast, take it off at 125 F. Medium rare would be 135 F. If you want well done, go away. I took the roast off and covered it in foil. I put the vegetables and juice in a saucepan. I added the remaining beef stock, the ketchup and the wine. Bring the mixture to a simmer and simmer for 15 minutes. Strain the vegetables out and then use a poultry baster to pull the liquid from under the fat that will rise to the top. At this point, you can use the liquid as an au jus on the beef or for beef dip later. If you want a gravy consistency, melt 45 ml (3 tablespoons) of butter in the saucepan. Add the same amount of flour and mix to blend. Slowly add the liquid and stir. Heat and simmer for about 5 minutes to thicken and cook out the flour. Carve the beef quite thick and serve. We served ours with roast potatoes (recipe to follow in another post) coleslaw and spinach salad. Although it costs more than I should actually spend, a prime rib is something you just have to make now and then. This was very classy and my brother and his wife loved it. Mix salt, pepper, onion powder and garlic powder together. Rub over the surface of the roast. Put the vegetables in a roasting pan. 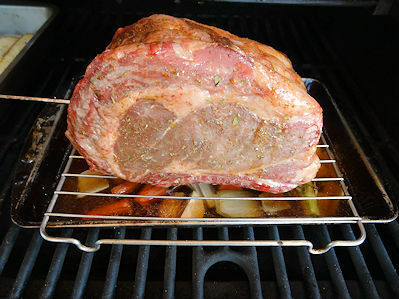 Put a rack on the pan, the roast on the rack and place it a smoker or oven preheated to 350 F.
In one hour, add 375 ml of the beef stock to the roasting pan. Cook to an internal temperature of 125 F for rare (about 1 1/2 hours) 135 for medium rare (about 2 hours). Cover the roast with foil. Put the vegetables and any liquid from the roasting pan in a saucepan. Add the remaining beef stock, wine and ketchup. Bring to a boil and simmer for 15 minutes. Remove the fat from the top of the liquid by using a poultry baster to pull the liquid from underneath. 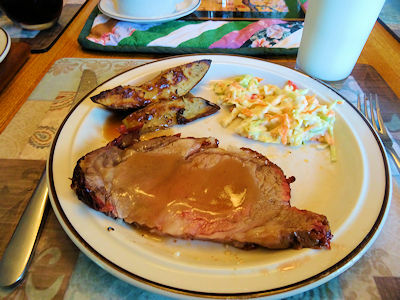 If you want a liquid "au jus" style sauce, carve the roast and serve. If you want a thickened gravy, melt the butter in a saucepan and stir in the flour to mix. Add the liquid slowly, stirring over medium heat for about 5 minutes to thicken and cook out the flour. It’s not my favorite cut of meat, but I’ve never had it smoked. Maybe that’s what I’ve been missing. I have to admit I prefer a pork roast but a prime rib isn’t bad. Gosh ~ that’s a nice hunk of beef! It was tasty but it cost more than I cared to spend. We want to try this recipe but our roast is 7.3 pounds. I did the math and your recipe is between 20-25 minutes per pound for rare/medium rare. Is it reliable to apply that same math and get a good result or is there something unique with the pellet smoker that we should consider (We’re using a Louisiana Grill). This is our first large roast and we don’t want to mess it up! It is a good time to shoot for but each piece of beef cooks differently. It is more important to cook to temperature than to time. Plan on 20 minutes a pound and cook to an internal temperature of 125 F for rare and 135 F for medium rare. Remember it can sit for up to 20 minutes under a foil tent if needed.